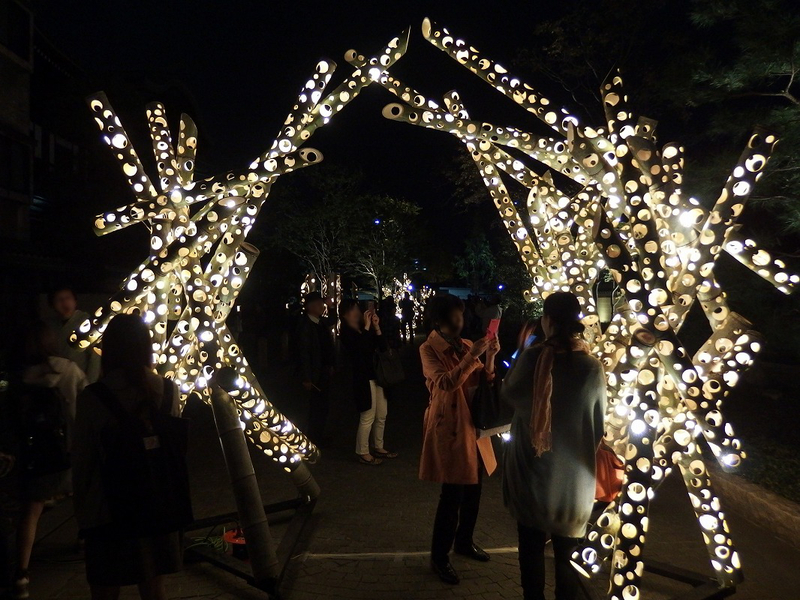 This time, I’m going to introduce “Hakata Light Up Walk 2016” of the autumn event in Fukuoka. 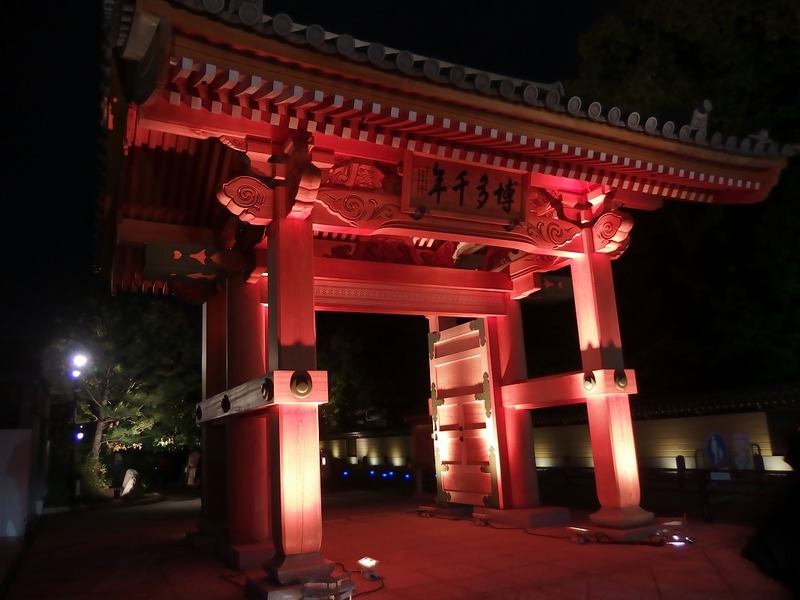 This is the event that light up the temples and shrines and their gardens that remain in Hakata area, and enjoy the historical scene with different atmospheres from the daytime. Dates: Nov 23rd – 27th. 2016. Time: 5:30 pm – 9 pm. Entry until 8:45 pm. Ticket: Advance: 1000 yen, Door: 1300 yen. 15 years old or less is free (Accompanied by an adult). Address: Hakata area. Please check the details at the bottom of this page. The event “spotlights” the historic temples & shrines. The old temples and shrines which remain even now along with the long history of Hakata in Fukuoka. 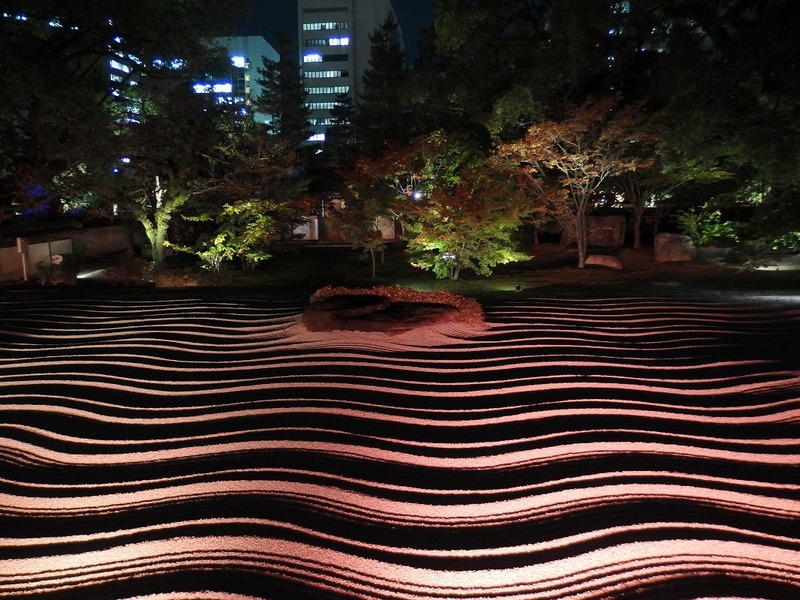 During the event, each temples and shrines and its gardens in Hakata area will be lit up. 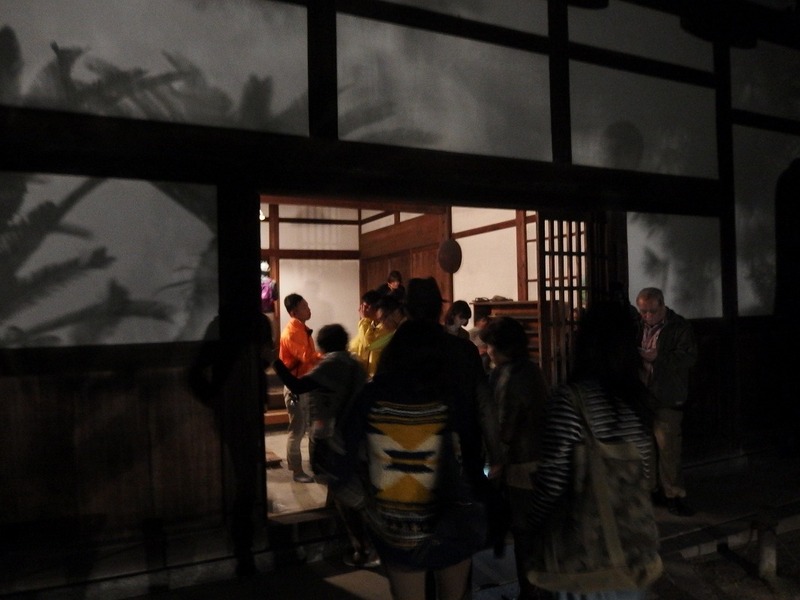 Furthermore, the place where we usually cannot enter is opened to the public. 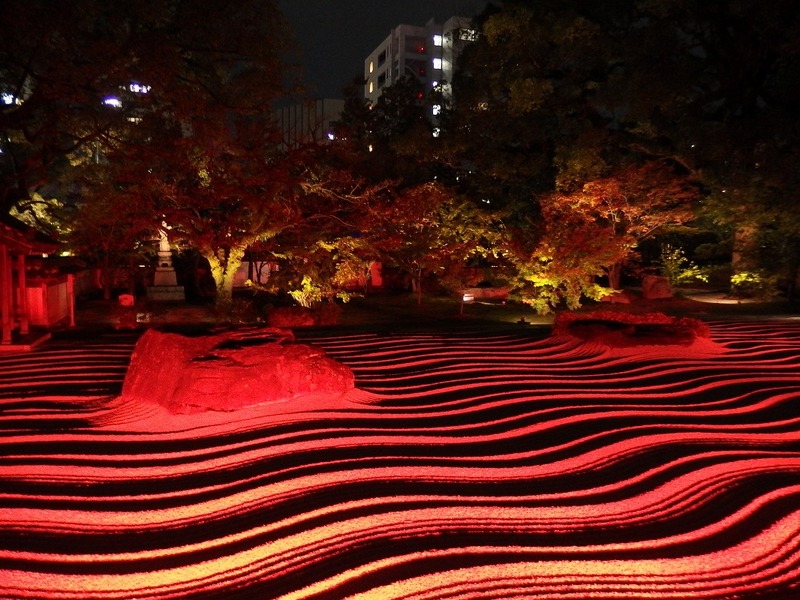 It is the late autumn event of Hakata that is expected more than 120,000 of crowds. 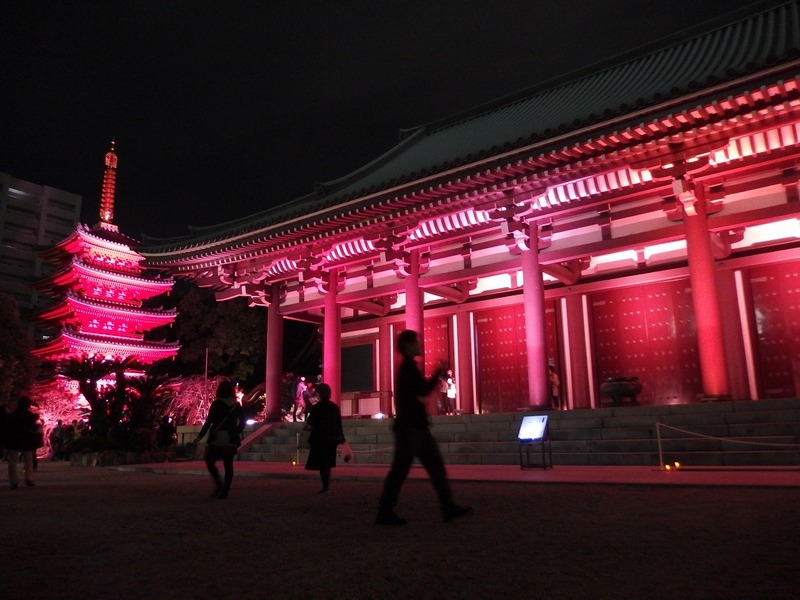 Including free locations, 13 places of temples and shrines will be lit up in 2016 (There were 9 places in 2015). Temples and shrines are located within a distance to be able to go on foot, even the farthest place is about 2 km away from JR Hakata Station. I’m going to introduce the three locations from last year, Jotenji Temple (承天寺), Tochoji Temple (東長寺), and Kushida Shrine (櫛田神社). Starting from JR Hakata Station, First I headed to Jotenji Temple. 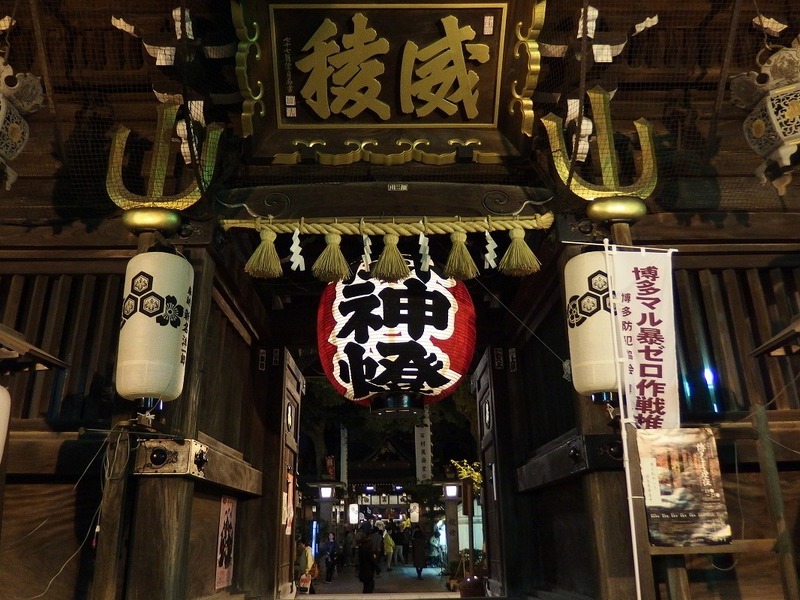 The Jotenji Street, which can be called the start spot of the visiting these temples and shrines has the “Hakata-Senenno-Mon (Thousand years gate)”. 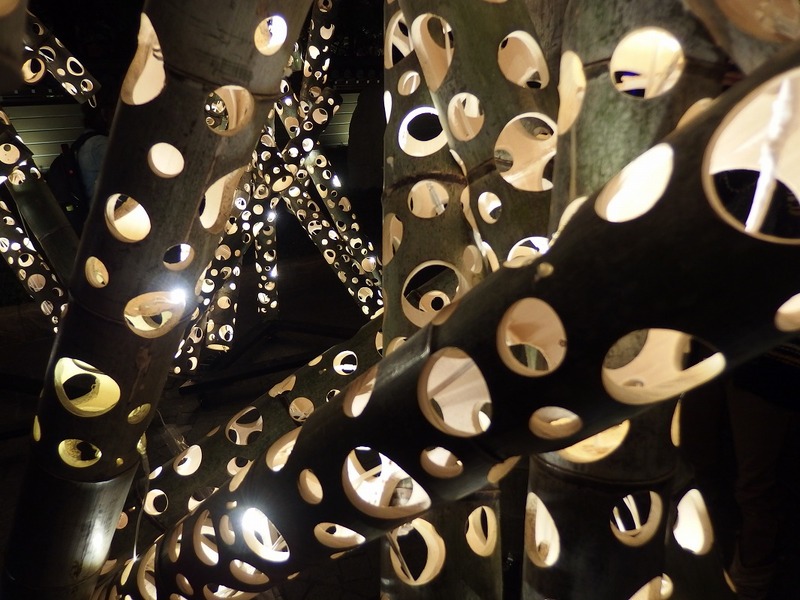 This gate was created in 2014 as a welcome gate to the town area that remains history and culture of Hakata. There was a ticketing place when I just walked on the Jotenji Street. Tickets are sold 1000 yen in advance, and 1,300 yen in today’s ticket. Arrived at Jotenji Temple. We can see a rock garden called “Sentotei (洗濤庭)” as well as a beautiful Buddhist sanctum at this temple. 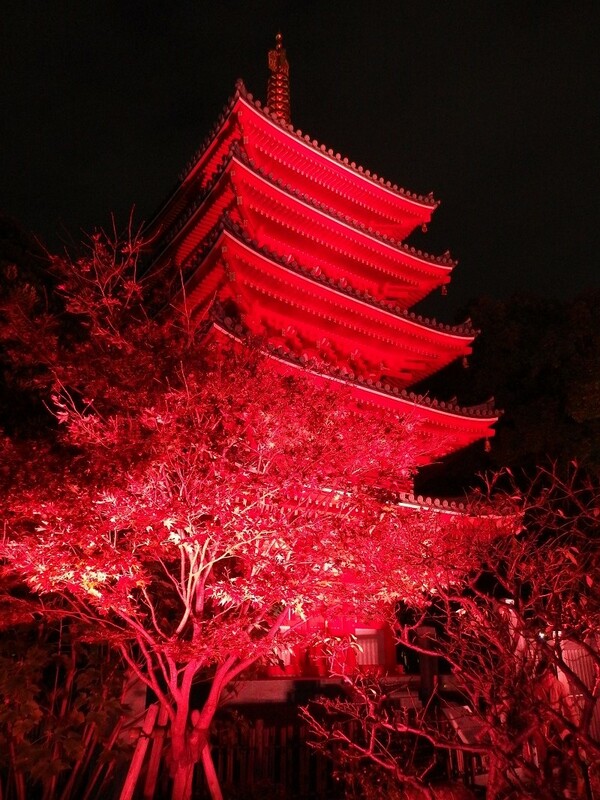 The history of Jotenji Temple started in 1242 by the Enni, who is the founder of this temple. There is a theory that the Enni brought back the recipe of Udon and Soba noodles and Manju (Steamed bun), such as those typical Japanese foods from the Sung in China. 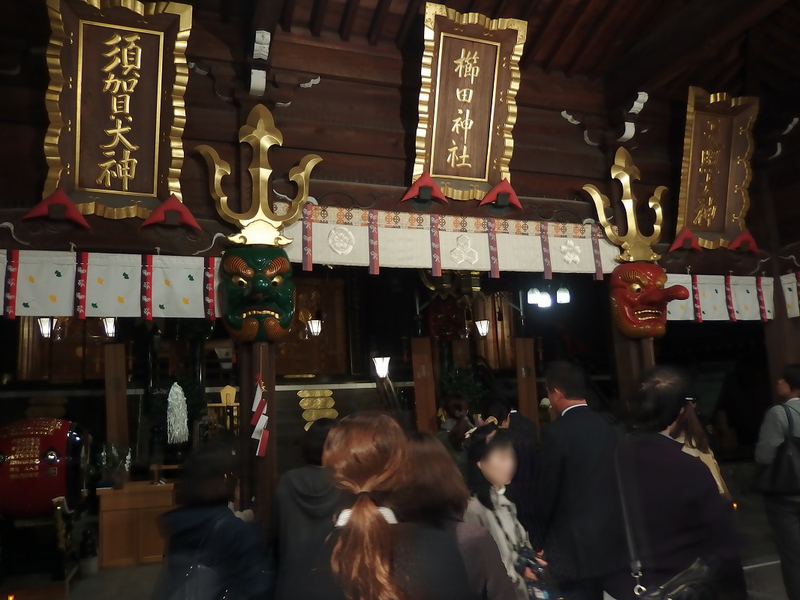 And also, there is a story that one of Hakata’s festival “Gion-Yamakasa (祇園山笠)” has been started by this Enni. The photo below is Buddhist sanctum (仏殿). 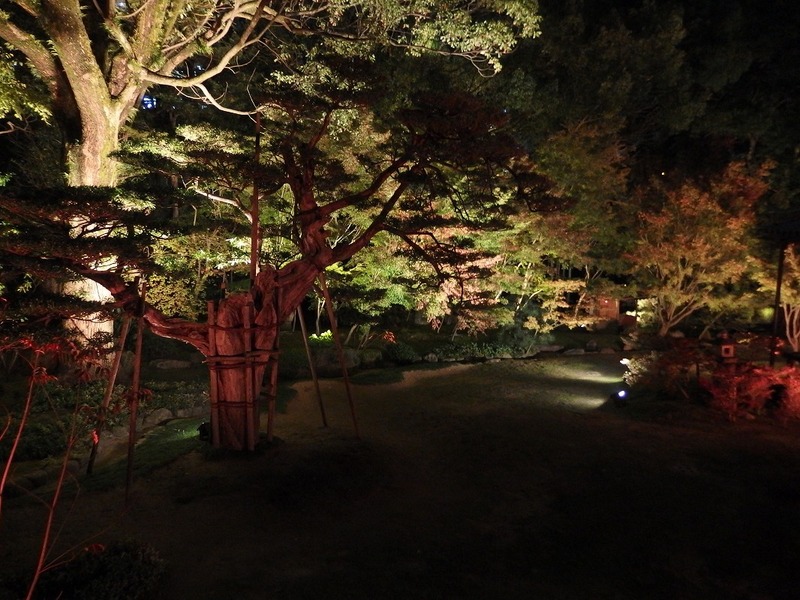 Moved to Kaizando (開山堂) to see the beautiful garden “Sentotei”. Here is the most popular place. Many people were taking photos. Red, blue or purple, it changes to a variety of colors. This is “Sensuitei (泉水庭)”. It was also a beautiful garden. I saw some shops opened when I got out from Jotenji Temple. 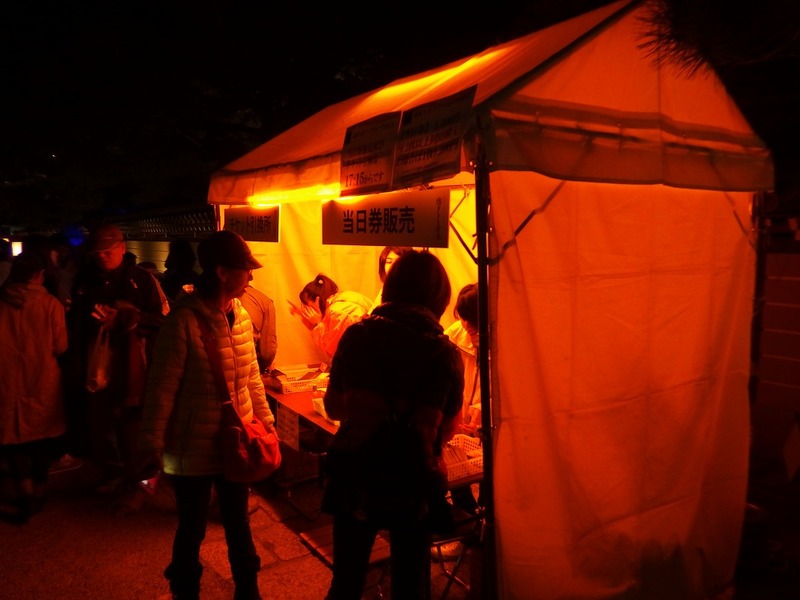 It is said “The night market of Jotenji Temple”. 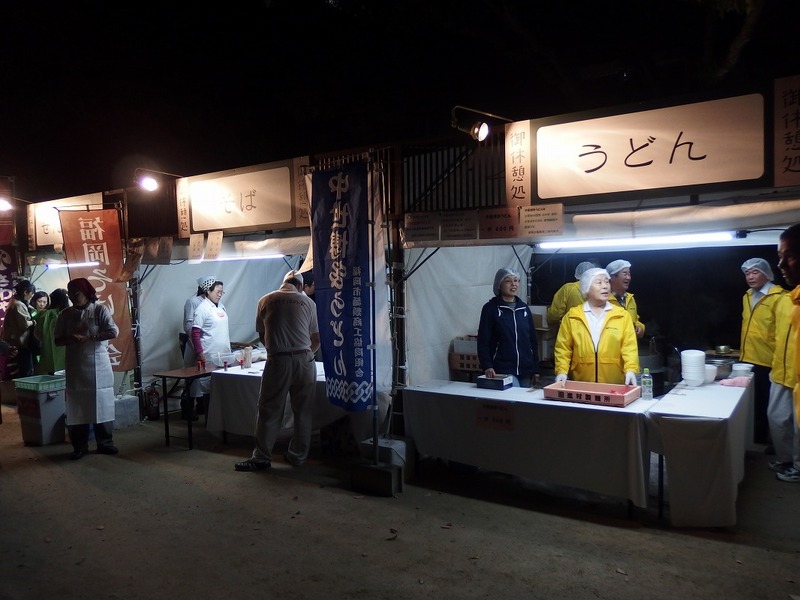 Udon and Soba, and the traditional crafts called “Hakata-Ori (博多織)”, those originated in Hakata were sold at this place. 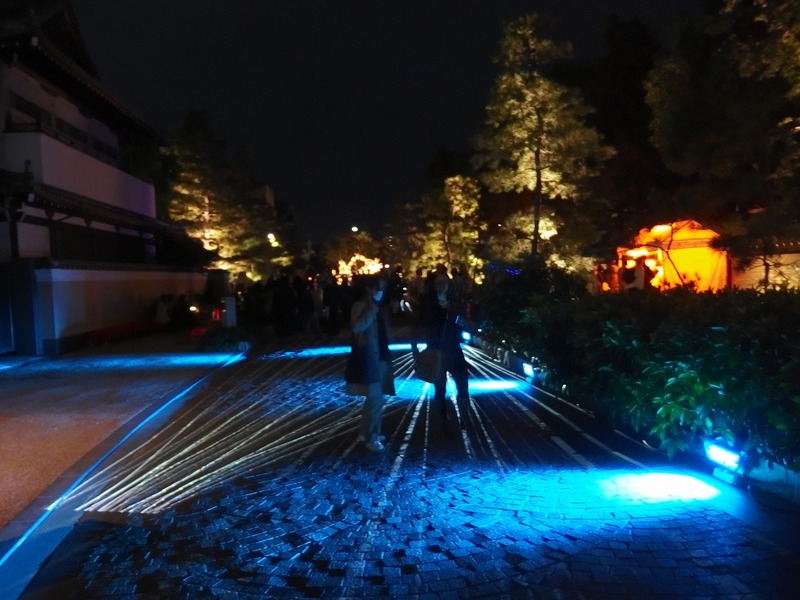 Furthermore, I was able to see “Take-Akari (竹あかり): The light of the Bamboo” on the same street. 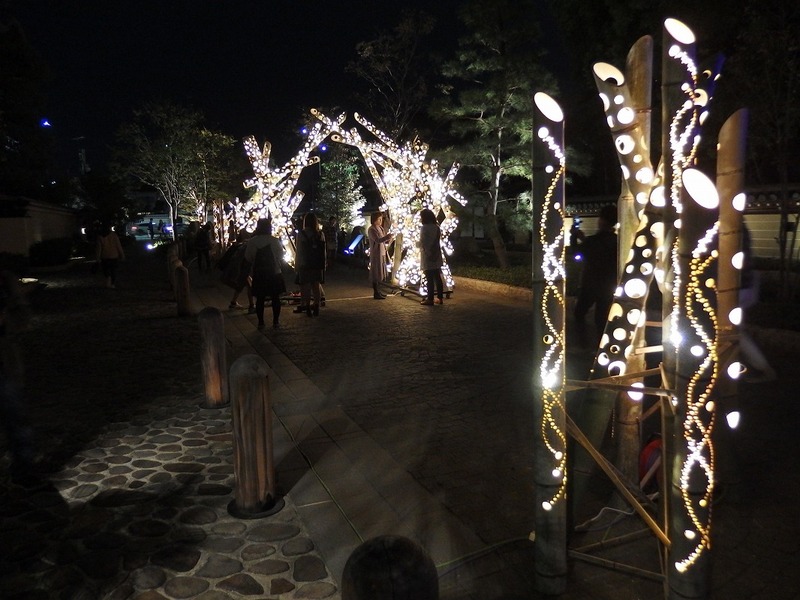 It uses bamboo as lanterns which has been used from ancient Japanese.It creates the fantastic world with illuminated bamboo. Next I visited was “Tochoji Temple”. It is only a 4 minute walk from Jotenji Temple. Since the temples around here such as Jotenji, Tochoji, Myorakuji, Engakuji are gathered within a few hundred meters, it is easy to access each other. Tochoji Temple is the temple of the Shingon sect, which was founded by Kobo-Daishi in 806 years. The highlight of Tochoji Temple will be the main hall (本堂) and the five-storied pagoda (五重塔). Its magnificence comes from the horizontal line of the large roof of the main hall and the colors of vermilion and gold of the five-storied pagoda. It is “Fukuoka-Daibutsu (福岡大仏)” enshrined in Daibutsu-den. 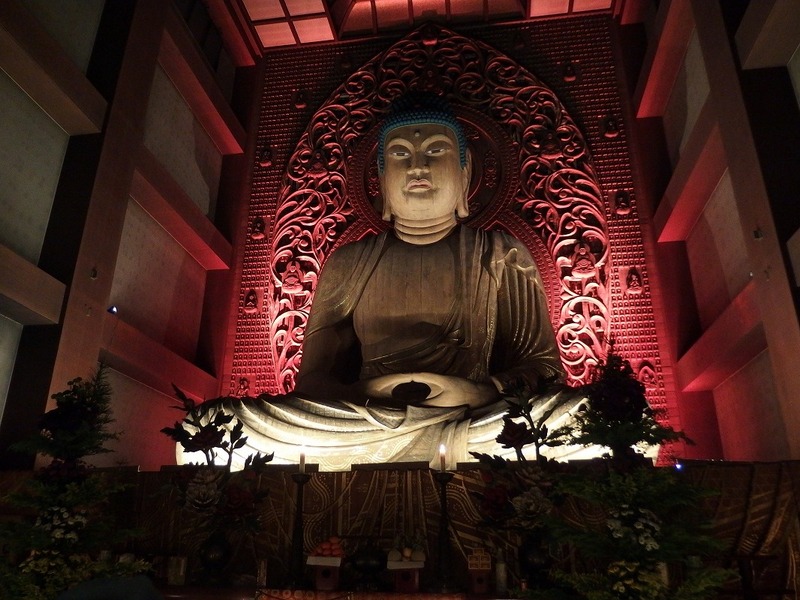 This statue of Buddha is made of Japanese cypress and it is 10.8 meters in height and 30 tons in weight. *Unfortunately, there is no light up for Fukuoka Daibutsu (Tochoji Temple) 2016. 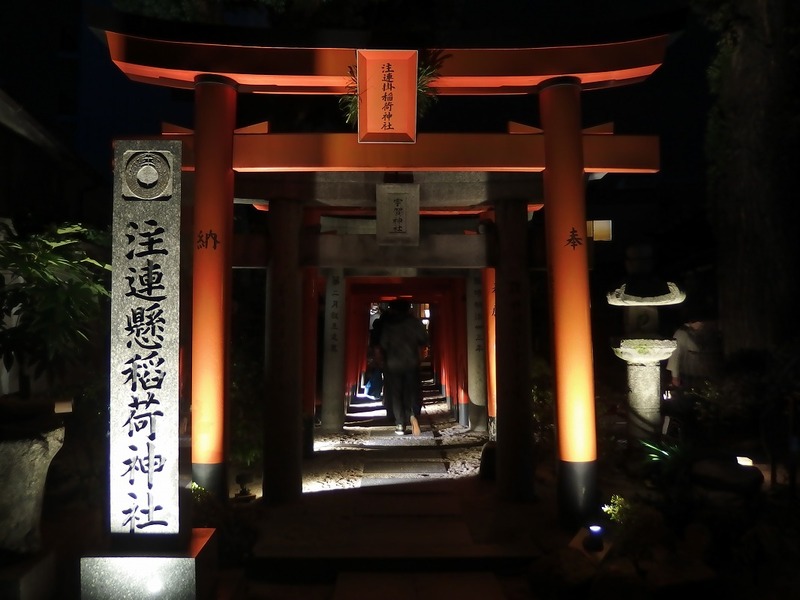 Kushida Shrine is a Shinto shrine, which is the Sochinju (総鎮守) of Hakata area. Simply put, there are shrines located in each region and they enshrine “Chinjugami (local shinto gods)”. Sochinju means it is the main shrine of those shrines. And so, Kushida Shrine is the Sochinju in Hakata area. The history of Kushida Shrine is very old, and the opening is considered to be about 757. Crowded with a lot of worshipers. This is called “Hakatabei”. 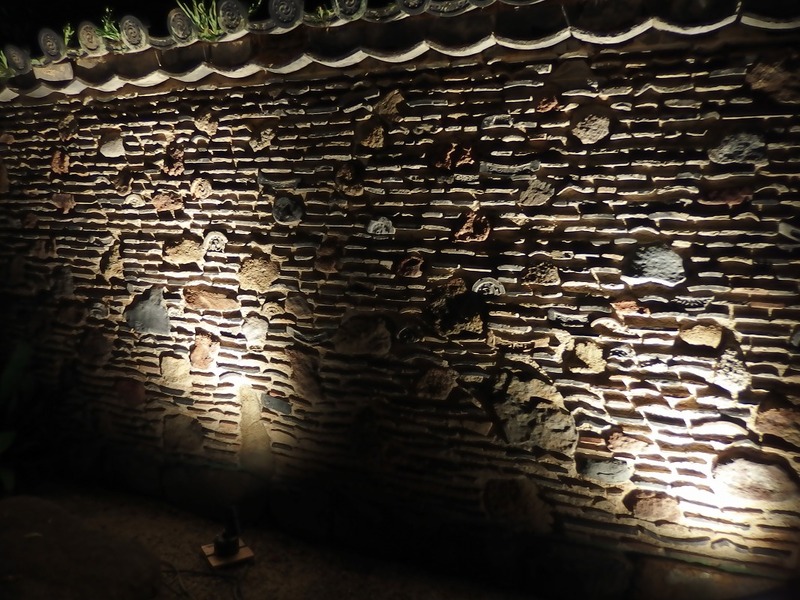 It’s the stone wall has the history of more than 380 years, and was transferred from the residence of “Shimai Soshitsu (島井宗室)” who is known as one of the Hakata Sanketsu (the three great merchants of Hakata). 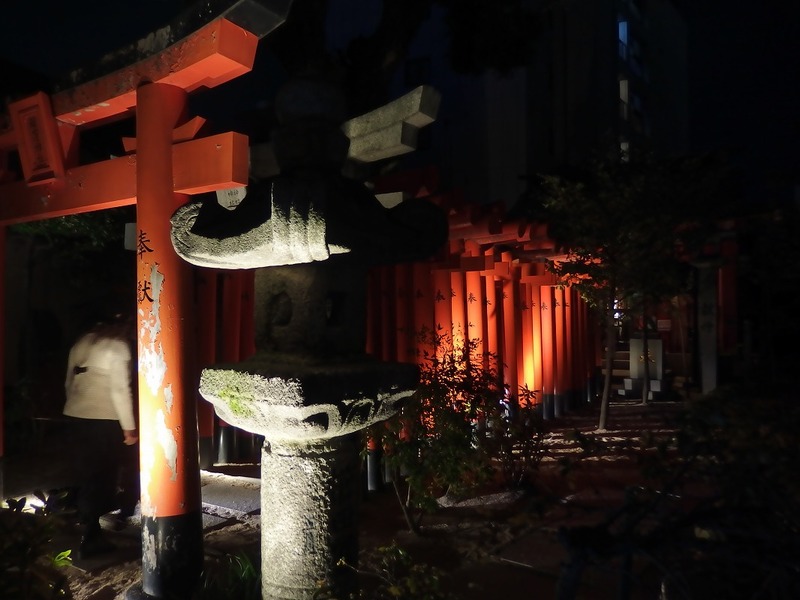 It’s a Inari-Shrine located towards the back of the Kushida Shrine. Array of vermeil Torii brings on a unique atmosphere. How was the short trip of temples and shrines of Hakata? I visited only those 3 places last year. I’m going to visit more places this year of 2016 and will show you later! Event date & hours: Nov 23 – 27. Pay; Kushida Shrine, Jotenji, *Tochoji, Myorakuji, Engakuji, Myotenji, Shojoji, Hongakuji, Zendoji, Kaigenji, Ryuguji. Free; Hakata-Sennenno-Mon, Katsuragijizoson. *No light up for Fukuoka Daibutsu (Tochoji Temple) 2016. 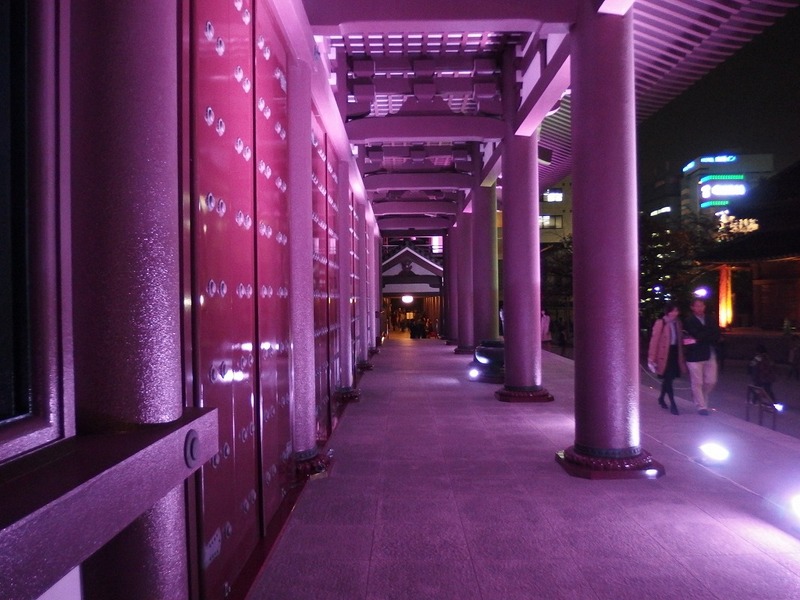 Access: You can walk from JR Hakata Station to any of temples and shrines. The farthest (Shojoji Temple) is 2 km away. Admission fee: Advance ticket: 1000 yen. Today’s ticket: 1300 yen. ← Highly Recommended Fireworks Display! Fukuoka Higashi-ku Fireworks Display!